What exactly are Muscle Activation Techniques (MAT) and why do they matter? Well, that’s a great question. Muscle activation technique is a revolutionary, scientific, and objective approach to correcting your body’s muscular imbalances and limitations. Among its many benefits, the practice of MAT can enhance your mobility and range of motion, as well as increase your joint stability. MAT is a non-invasive technique that is designed for those who are looking to pursue the betterment of their life, by jump-starting their muscles to achieve maximum results. From athletes and rehabilitation clients to those who have struggled with everyday exercise programs, MAT can be a beneficial avenue for anyone to include as part of their fitness regimen. • Pursue your best and reach your goals without gimmicks or fads that end up hurting people in the long run. • Our clients have our 100% attention during each and every session. • Work with the teachers instead of the students! 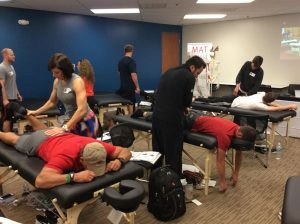 MAF is THE only approved tutoring and certifying body of MAT for trainers & therapists in the Southwest. Much more than your ordinary training session, MAT is a science-based, personal training method of corrective exercises that works. Working with our trainers, you get a personalized corrective exercise program that is designed to restore your muscle functions, thereby strengthening your body and increasing your ability to move. When you come to Muscle Activation Fitness, the first thing we will do is assess your muscles and movement patterns, evaluating your ability to contract them efficiently. If you suffer from decreased range of motion, or loss of muscle contraction, your physical performance will be compromised. It is our goal to help you correct those problems in order to help you reach your fitness goals by moving without limitation.